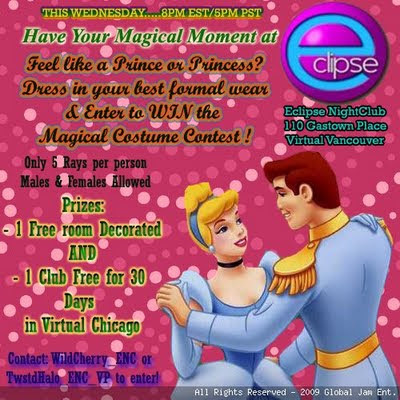 THIS WEDNESDAY ECLIPSE NIGHTCLUB WILL BE HAVING A MAGICAL COSTUME CONTEST & PARTY FOR MEN & LADIES! AWESOME PRIZES: A CLUB FREE FOR 3 1 MONTH & 1 ROOM FREE DECO!.....TO ENTER CONTACT WILDCHERRY_ENC or TWSTDHALO_ENC_VP. STARTS AT 5PM PST/8PM EST. ONLY 5 RAYS FOR THE ENTRANCE FEE! YOU GOTTA BE THERE!! !